Side projects and collaborations can often be a hit or miss affair. They can range from the smaltzy record label created supergroups of the 80’s to the sublime combinations of gifted artists who generate luminous alchemy that captures a moment of brilliance. 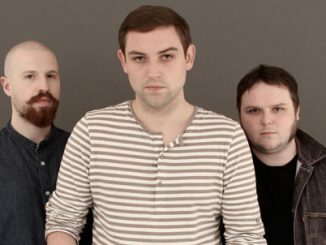 The collaboration of The Twilight Sad’s lead singer/songwriter James Graham and lauded solo artist Kathryn Joseph is one of the later instances. The third member of Out Lines, producer extraordinaire Markus Mackay provides the third leg of the triangle that allows this collaboration to reach heights of emotional and musical genius. Their resulting October 27th release “Conflats” is a remarkable distillation of all the participants’ musical skills. The project that would become Conflats originated out of a commission request to James Graham from Alun Woodward. Woodward approached James Graham and asked him to write songs based on conversations with the participants of the Easterhouse Project. Woodward, formerly of the Delgados, is now the music promoter at the Glasgow community centre Platform. The platform puts on the Outskirts Festival and also operates The Easterhouse Conversations Project. This project is included in Platform’s year-round programme of cutting-edge theatre, exhibitions, and workshops which are offered to enrich the community. Graham would agree to take on the commission. His being a fan of Kathryn Joseph’s 2015 Scottish Album of the Year winning release, Bones You Have Thrown at Me and “Blood I Have Spilled, led him to suggest she be approached to collaborate on the project. Joseph originally had reservations but when she found out Graham had asked specifically for her, agreed to give the idea a try. Markus Mackay came into the project on Joseph’s behest as he had collaborated with her on her debut release. Mackay’s production credits read like a who’s who of current Scottish Music and his deft touch is evident throughout the release. Graham and Joseph would jump in the deep end conducting interviews with community members who would provide the inspiration for the lyrics and themes. The two quickly ascertained that the challenge for the release would be attempting to be honest to the conversations while protecting the individuals they interviewed. They would need to transform individually aching occurrences into universal topics. What would come out of the effort was a textured, bittersweet result that discusses substance abuse, incarceration, grief, displacement and vulnerability. The pair’s ability to pull off the challenge was rooted in their already highly developed storytelling skills that prior to this were expressed beautifully in their musical day jobs. Sonically the album utilizes traditional folk elements, piano, harmonium and bass-laden synth pulses. The trio gets the most out of every note while spotlighting Graham and Joseph’s alluring vocals either in solo or harmonizing duet. Additionally, Joseph performed piano and harmonium duties while Mackay worked on production and percussion. Conflats is not light pop fare but a powerful collection honouring the strengths and beauty of the human spirit even when it is surrounded by the darkest of times. The three artists balance the hardship and sadness found in the original conversations with resolve, defiance and solace. 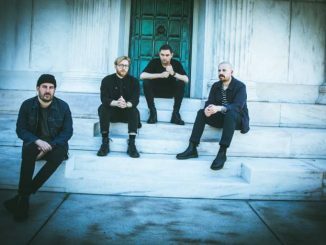 Buried Guns the first released song is a perfect blending of Joseph’s prior work and Graham’s insights from his Twilight Sad’s output. Vocally Graham provides terrestrial grounding while Joseph offers the otherworldly spectre that transcends the track. The sonics are dirge-like with sparse percussion and harmonium setting the mood. The theme speaks to those things buried in our past and subconscious which act like long forgotten landmines threaten to trip us up and destroy us. Buried Guns is hard to shake off and a memorably haunting track. Our Beloved Dead has a more Celtic folk feeling and gets a tremendous amount of sound from the minimal instrumentation. The subject is death and grief and how it can bury the survivor alive, “I’ll take you down with me”. There is a slightly sinister feeling throughout that creates goosebumps in its keening melancholy. Graham is captured displaying all of his vocal skills and Joseph is channelling Kate Bush in all her glory. The Left Behind counterbalances brooding with a soaring effect. Here Joseph takes up the main vocal at the start, with another song that deals with those left in sorrow. There is a quiet grace expressed in “I will wait; I will mourn; for still I am left behind.” The song is loaded with drama and very evocative. There is a Saved Place is slightly more uptempo with a great piano and percussion interface. There is an inspired combining of Graham’s spoke voice with Joseph’s vocals which are representing the inner voice of the narrative. Examined are human fears and concerns that overwhelm a person when they isolate themselves but are eased with communication and communion with others. The song underlines the importance of areas in the community that have as their ultimate goal the providing of a place where personal interaction can occur. This interaction acts like a Freudian Talking Cure. There is a Saved Place is one of the many high points of the release. The heartbreaking If You Love Me You Will Lie portrays the narrative of a couple clinging to a failed relationship. The harmonium which delivers much of the emotional impact musically throughout the album has, even more, impact on this track. The song is sad but so forthright it pulls you in and will not let you go. It is spectacular and the “Do Not Miss” track of the release. Open and Shut reminds me of early The Twilight Sad without the shoegaze bombast. The topic again is a relationship in peril displaying it from different perspectives. Each perspective is divergent to start but as the song unspools the same conclusions are reached in the end. The lyrics reveal that is the things the couple keeps from each other that are killing the relationship making them feel they can’t cope anymore. 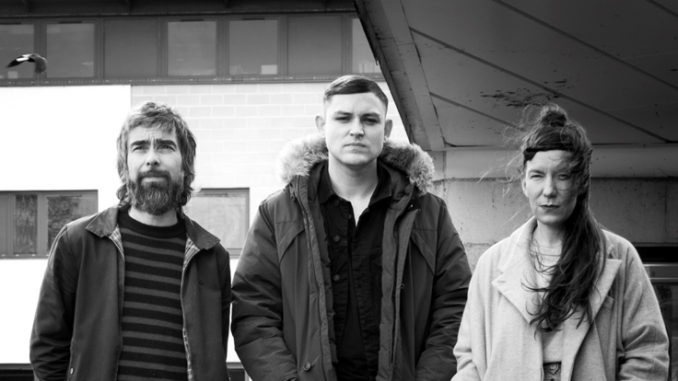 These Three Desire Lines closes out the album with a haunting swirling track. Graham and Joseph weave a sonic tapestry of bittersweet lyrics. The song drifts off into the ether with mantra-like lyrics that beckon the listener to hold on. Conflats is the capturing of each member of Out Lines musical strengths blended together and producing something transcendent. The sparse chilly sonics with minimal percussion provide the canvas that Graham and Joseph’s lyrics perform upon delivering a haunting, evocative and deeply moving impact. The overall message conveyed is that emotions are better expressed then held in where they corrode the spirit. Graham, Joseph and Mackay pull off a difficult challenge with what seems to be effortless deft and sensitivity to their inspiration. They do not exploit the people behind the project but instead offering their experiences giving them a voice and hope. This is a perfect rainy day in autumn accompaniment and I only wish there were more songs. Conflats is probably a once in a lifetime convergence for this trio of artists, but extremely worthy of musical listeners attention, it is a brilliant release.